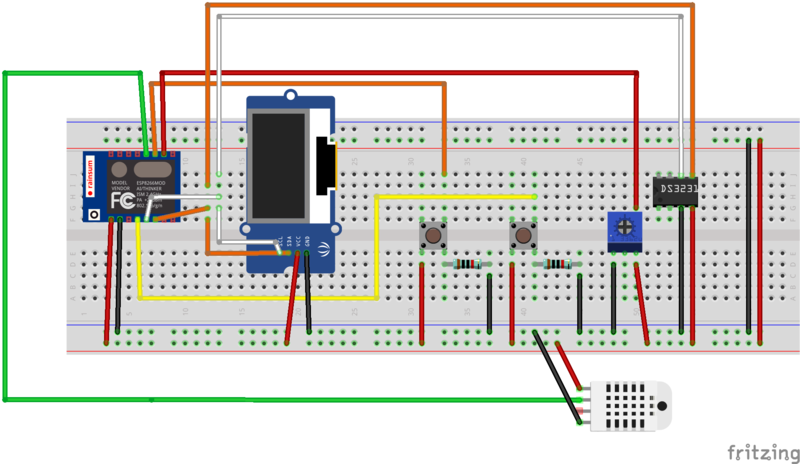 WiFi weather station with sending data on line and graphical rendering of them. This little Weather Station is developed assembling necessary components (bought separately) and it's programmed to gather data related to temperature and humidity from a specific sensor DHT22. Periodically, after a defined interval time, the Weather Station is connecting to home network via WiFi and the data related to Humidity and Temperature are sent online and stored remotely into a MySql database. The OLED Display (2) is showing the values for temperature/humidity and the set interval time to upload data. Also date and time are displayed, get from real time clock RTC. Pressing Button B (4) the data for temperature/humidity are immediately sent and stored on line. The following screenshot is showing the project web site (for the moment only in Italian), where the data are displayed. Click here to go. In this video the start-up process. The station is connecting to home WI-FI, get the IP address from router then displaying the value for humidity and temperature. The appHumid.js file (and also appTemp.js file) are calling the file http://funnytech.atwebpages.com/tms/dataTemp.php where is defined the database connection, query to get data and also query execution. Data are passed back to calling file (appHumid.js) for rendering. The file add.php is called directly by the station (see sketch code) to store data into database. Hello Everybody, I'm a code developer that I'm spending my free time enjoy with Arduino and other prototyping device. I'm leaving in Prato.